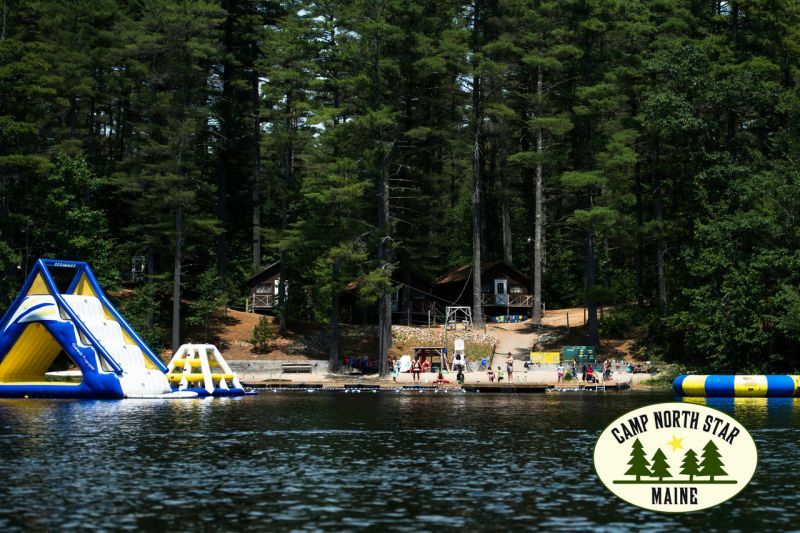 Camp North Star is a family-owned, traditional overnight camp located on 200 pristine acres and a private lake. North Star campers enjoy an elective program with 100+ choices in arts, athletics, enrichment, outdoors and waterfront activities. Guided by a nurturing and experienced instructional staff, every day is an extraordinary opportunity for growth and skill development. Not all camps conform to the idea that many people might have of camp, though North Star, in all the best ways, truly does. On a wooded property, on a lake, it offers all the traditional activities that you’d expect from a summer camp. That said, the experience isn’t really about activities; those things are just tools that the counsellors and staff use to do other, better things, such as encouraging campers to gain a sense of themselves, their talents and challenges, and a greater understanding of their place in the world. Steven and Brooke Bernstein are the definition of camp people, having spent the better portion of their lives at camp, thinking about camp, and developing the programs at North Star. As such, were you to ask them about what the camp offers, they’d talk about values, friendships, resilience, and community. That’s what camp is all about, and is also the reason that parents, rightly, turn to Camp North Star. Thank you for your interest in Camp North Star! We are committed to partnering with parents to create outstanding summer camp experiences for their children. After learning more about our philosophy and program, and our beautiful lakefront setting on 200 pristine acres, we hope you’ll agree that Camp North Star is the ideal choice for your child. Camp North Star offers your child the many benefits of a traditional, residential summer camp in Maine, plus the personal attention of a caring, highly trained staff that is dedicated to nurturing healthy youth development. We work diligently to make Camp North Star a supportive community where children make lasting friends, build strong relationships with positive role models, connect with nature, explore new interests, pursue favorite activities, and practice 21st century skills that help them succeed in school and in life. We welcome your questions by phone or email, and will gladly schedule a personal home visit or Skype video call at your request. We know that choosing the right summer camp is an important decision, so we are always available to help in any way we can. We look forward to speaking with you soon! For many kids, heading off to camp for the summer is a real rite of passage. It’s likely their first time away from their parents and home for more than just a sleepover down the street, and the best sleep-away camps provide a taste of independence while still supporting the social and emotional needs of young campers. To that end, one of the major goals of Camp North Star is to help campers learn how to make and keep friends during their time in Maine. For many young people, making friends at camp is easier than at school, and research shows a full 96 percent of campers say that camp helped them to make new friends. Camp North Star is dedicated to teaching this life skill in three major ways. Camp North Star is a tech-free summer camp for kids, and for good reason. There’s growing evidence that texting and communicating via devices instead of face-to-face communication is hindering kids’ emotional intelligence and ability to connect with others. Camp North Star offers the rare opportunity to disconnect from TV, video games and smartphones. Instead campers spend time having real-world experiences instead. Without the crutch of a device, kids spend their time reading each other’s faces and developing their interpersonal skills the old-fashioned way — a crucial 21st century life skill. Taking away the tech is hardly a punishment, because Camp North Star replaces it with unbeatable scenery and a connection to the natural world. Set in a pristine location on 200 acres, Camp North Star offers a wide range of sports, waterfront and outdoor activities that get kids moving and working together to problem solve and play. Psychologists tout the benefits of time in nature as everything from reduced stress to more creative thinking, and structured activities provide kids a framework for interacting with each other and making new friends. At Camp North Star, counselors are trained to guide the development of each individual camper. This includes an attention to helping kids develop communication skills. With attention to social, emotional and physical elements of communication brought to every activity, camp staff guide campers to treat each other with respect and provide the tools to build lasting friendships. Camp North Star’s mission is to help campers become the best versions of themselves. Making friends is built into the philosophy of everything they do. Come to Camp North Star in Maine to see just how easy it is to make new friends that will last a lifetime. The Camp North Star experience for our campers is all about making new friends, developing new talents, learning valuable life skills and growing as an individual. Being attached to or using your cell phone or other piece of technology is not something you’ll see walking through our 200-acre property in Poland Spring, Maine. Camp North Star is proud to be screen-free and technology-free. We want our campers to make strong connections with their camp friends and counselors not to a Wi-Fi network or the internet. The rest of the year, our campers are most likely part of an alarming set of statistics that has been on the rise recently. Teens are spending nine hours a day using digital media, with tweens falling not that far behind dedicating six hours a day to their smartphones or tablets. It is clearly a struggle for youth to manage their digital footprint. Wendy Mogel, a clinical psychologist and the author of the parenting book “The Blessing of a Skinned Knee,” tells the story of a college student at a salad bar who texted her mother to ask if she liked ranch dressing, rather than testing it herself. Such dependent relationships can rob children of the chance to trust and believe in someone else besides their parents. Creating bonds with campers and staff is one of the most important benefits of the North Star experience, and it happens more naturally without the use of technology. It is refreshing for our North Star community to unplug from technology during the camp season. It’s a much needed detox from cell phones, gaming systems, tablets, and laptops for a few weeks. Instead of using technology we see campers interacting more often with their camp friends by playing cards, a board game, a sports activity, or just having a face-to-face conversation. One of the goals of our technology-free policy is to give our campers the ability to develop deep relationships and strong interpersonal communication skills without the distractions of their cell phones and social media. Parents often tell us that their child’s time at Camp North Star provides a much needed break and a chance for kids to just be kids. And that’s one of the most important facets of the North Star experience for our campers. Spending your first summer at sleepaway camp can make new campers and their families feel anxious. At Camp North Star, we go to great lengths to ensure that campers feel comfortable before they even leave home. New families meet with Brooke and I during a home visit or talk with them during a video call. This starts the process of Camp North Star partnering with parents so we can provide the best possible experience for their children. Parents feel comfortable that there is always an open line of communication with our directors during the summer and offseason. The home visit is the perfect opportunity to share any personal information about your child as well as discuss the goals and expectations you and your child have while they are spending their summer with us in Poland Spring, Maine. A typical concern of new campers is wondering how easy it will be fitting in and becoming friends with their fellow campers. One of most important life skills our campers learn is how to make and keep friends. We help our new campers develop a friendship before they even arrive on our 200 acre property. We connect each new camper with a returning camper through our Camper-to-Camper program . A returning veteran camper will call a first time camper by phone in late May or early June. This gives new campers the chance to understand more about our camp on a peer-to-peer level and allows them to connect a face with a name on arrival day. Camp North Star also makes the transition easy for families as well. We realize that parents are anxious to know how their child is enjoying camp. That’s why we have our Boys and Girls Directors call every new family during the first two days. The director updates the families on their child’s schedule and answers any questions. We also frequently post updates on our social media channels as well as post photos our password protected photo gallery on a daily basis. And, if you need to contact any of our directors at any point during your child’s stay with us, we are just a phone call or email away. We are always happy to take your phone call or respond to your email. Every family receives a Parent Handbook each summer. There’s a wealthy of valuable information inside including mine and Brooke’s cell phone numbers which you can call 24/7. These steps help both the new camper and their family feel comfortable about the Camp North Star experience. Interested in Camp North Star?